On October 22, 2018, State Councilor and Foreign Minister Wang Yi held talks with Foreign Minister Augusto Santos Silva of Portugal in Beijing. Wang Yi expressed that Portugal is a trustworthy good friend and good partner of China in Europe. Under the current situation that international rules have been impacted and multilateralism has faced challenges, the Chinese side is willing to, together with the Portuguese side, strengthen unity and coordination, and enhance strategic mutual trust, so as to not only promote the development of China-Portugal relations, but also contribute to world peace, stability, development and prosperity. 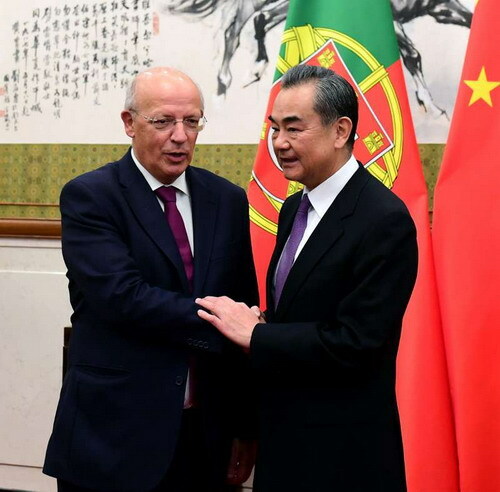 Wang Yi pointed out that the Chinese side attaches importance to the Portuguese side's positive aspiration to strengthen China-Portugal comprehensive strategic partnership and deepen practical cooperation, and is willing to make full preparations for important high-level exchanges between the two countries in the next phase. The Chinese side appreciates the Portuguese side for supporting the joint construction of the Belt and Road Initiative, and is ready to constantly expand new fields and new space of China-Portugal mutually beneficial cooperation by strengthening connectivity of the Eurasia. The Chinese side also stands ready to deepen bilateral cooperation in such fields as trade, investment, law enforcement and tourism, and promote third-party market cooperation to achieve concrete results. Efforts should be made to well establish the "blue partnership" between the two countries and carry out maritime cooperation. Both countries should further intensify exchanges on education, culture, science and technology and at local levels to consolidate the public opinion foundation for the development of bilateral relations. Augusto Santos Silva noted that Portugal and China have enjoyed close high-level exchanges, high-degree political mutual trust and fruitful achievements from practical cooperation. The legislative institutions of the two countries have maintained regular exchanges. The Belt and Road Initiative proposed by the Chinese side and expanding Euro-Asia connectivity share the absolutely same goal. The Portuguese side is ready to actively participate in the joint construction to become an important hub connecting the Euro-Asia land and maritime Silk Roads. As next year marks the 40th anniversary of the establishment of diplomatic relations between Portugal and China and the 20th anniversary of Macao's return to China, Portugal-China relations are facing important development opportunities. The Portuguese side stands ready to, together with the Chinese side, well make overall preparations for high-level exchanges between the two countries in the next phase, and take it as an opportunity to advance practical cooperation in various fields, enlarge trade and investment scales, deepen people-to-people and cultural exchanges, and ensure the sustained, sound, stable and forward-looking development of bilateral relations.